At first I noticed her individual look – black and elegant stylish. When I talked to Anita Keckeis I was charmed by her humour and positivity. She is an embroidery designer from Austria, living in Berlin and truly special! At the age of 12 she already knew what she wanted to become. Today she is living the life of her dreams and creates exclusive textile-jewels. Each of them awesome and special, too. 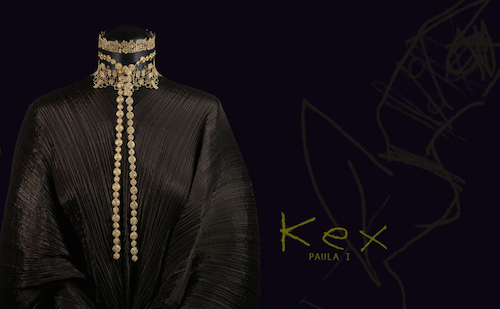 Every single scarf, collier and belt of her Label KEX is produced in a limited edition of no more than 98 items. She has already received a lot of appreciation and sold her embroidery even at the Tate Modern in London. And I am totally sure – there is lot more to come! Her creations attract self confident and modern women – and so is her message to us: Go girl, dare yourself and have fun!